Greetings guys! I know I was complaining about it not being Fall yet a few weeks ago. But I'll admit... it's kind of really cold now haha. I'm so ready for some hot chocolate as I watch horror movies during my swatch-a-thons. Actually that's exactly what I ended up during last night since my heater isn't working where my nail corner is. Figures, right? I'm hoping for someone to come out and take a look because I'm freezing whenever I step foot upstairs. But anyway time to get to today's Halloween swatches and review. For today I have some very cute Halloween polishes from Polish Addict Nail Color! This is the first time I'm reviewing this well known indie on my blog and I'm really excited to say the least. Let's take a look! These Halloween polishes from Polish Addict Nail Color are all still available for purchase while supplies last. Two of the four are also on sale right now and you can purchase them for half off. Trick or Treat is a pale orange crelly with a mix of glitters in various sizes and shapes. This particular polish is the October LE and is also on sale for $5.00 for the full size. Out of all the ones I'll be showing today this is definitely my must-have. I'm not usually a fan of light oranges shades, but this one hits the perfect spot on the color chart. I love the way it reflections off my skintone. It reminds me of pumpkins and I think this polish despite its name will be fantastic the entire Fall season. Formula and consistency are excellent, not too thick nor too thin. It's also jammed full of glitters and didn't cause me any fishing. I used two thin coats and sealed it off with a topcoat. The Walking Dead is a gray crelly with a mix of green, brown, copper, blue, orange, neon green, pastel green, pastel pink, and gray glitters. It has been slightly reformulated from last year. Before I say anything about the polish itself, let me just say that yes I'm a huge of the namesake. As if that should ever be a question. The first thing that captured my attention was the perfect glitter combination, it captures a rotting zombie so well. Just what ever girl wants haha. For these swatches, I used three thin coats and sealed it off with a topcoat. Formula and consistency were pretty good, it gave me no issues layering. There was a tiny bit of fishing for glitters, however, I was also applying from a mini bottle so that should be taken into account. Halloween Party 2.0 is a glitter topper with a mix of various glitters and colors. Reformulated from last year. I loved this topper from the moment I saw it. It's loud, fun, and totally in your face... just like me when I'm on a candy high on Halloween. The amount of glitter in this polish was absolutely ridiculous, I actually had to put some back in the bottle. Note though, this is a clear glitter topper and is being shown here over Lime Accent by Maybelline. Fantastic formula, as I mentioned the glitters are super easy to take out and require no fishing. You'll definitely want to seal this polish with a topcoat for a smooth finish due to the large amount of glitters. Punk Rock Chic is a gray crelly with a mix of purple, black, and pink glitters. This polish has also been reformulated from last year. I don't think my swatches do this polish any justice whatsoever. I love the edgy girl feel it gives off, which is what made me choose it in the first place. 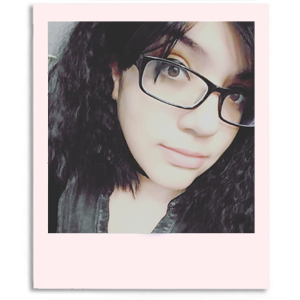 I used to be a rocker punk girl back in highschool rocking the guitar pick necklaces and multi-colored hair. Wish I had this polish back then to make me a real badass, haha. Out of all the ones here today, I liked the formula for this one the least. While it didn't cause me trouble applying, it was a bit thicker than the rest for layering. Again, please factor in the mini bottle because it does make a huge difference sometimes. I used two thin coats and sealed this glitter heavy polish off with a glossy topcoat. Overall my expectations with these Halloween themed polishes by Polish Addict Nail Color were definitely more than met. My top two favorite if I had to sit down and pick would have to be Halloween Party 2.0 and Trick or Treat. It's actually funny because these two are on sale right now, going for half off while supplies last. Definitely suggest picking up your favorite. For the most part, Polish Addict Nail Color has a great and solid formula with these crelly polishes. I experienced no major issues and just a little bit of fishing here and there. I do strongly feel had these not been minis I wouldn't have had any issues at all. 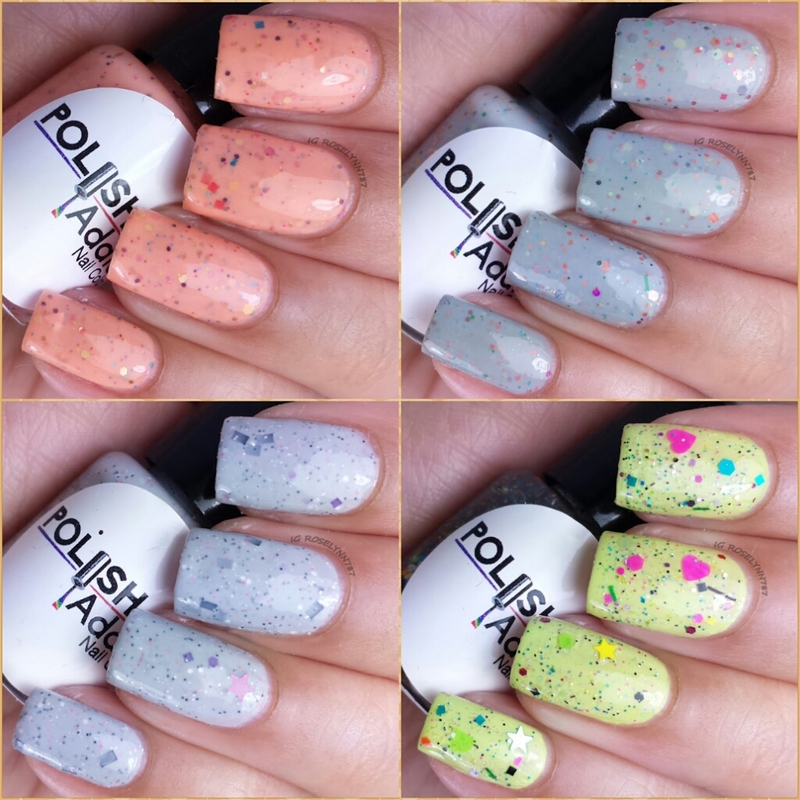 If you're not already go give a follow to Polish Addict Nail Color and keep up-to-date on the latest stock information, sales, and new collection releases. Speaking of which, the shop has just released photos of their massive Fall collection available tomorrow October 23rd.